It was made official yesterday on national letter-of-intent day; Scott Corson is headed to the University of Pittsburgh to continue his football career. With his mother by his side and Coach Bob Arcurio looking over him, Corson put the ink to the paper on what is the first day that high school seniors can make an official, written commitment to a school. Although Rich Rodriguez of West Virginia made a late play to get him to Morgantown, Corson stayed true to his word and his verbal commitment to Coach Dave Wannstedt that he made months ago. Pitt is coming off a 5-6 transitional season with Wannstedt in his first year at the helm while the Mountaineers are fresh off a Sugar Bowl victory over Georgia. Corson was thought by some to be looked at from the defensive side of the ball however it is projected that he will go into Pitt as an offensive lineman. Of course, this early in the game so many things are subject to change but for now he'll be worked out as an offensive lineman. That could give him an opportunity to eventually block for LaRod Stephens-Howling again. Stephens-Howling was the Panthers' leading rusher last season and with the departure of Rashad Jennings (transferred out) he is the top returning back for Pitt. 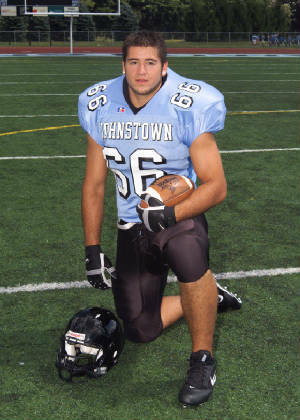 Corson has won multiple awards based on his play at Johnstown. Most notably he was recently named to the first team of the AP Class AAA All-State team. He has also won all-state honors from the Pennsylvania Football News as well as all-area from the Tribune Democrat and all-conference from the LHAC. He was recently named to play in the PSFCA East-West game and will likely represent the Trojans in the annual Ken Lantzy game as well. In what turned out to be his swansong with JHS, the two-way lineman had 9 tackles from his defensive line position in a District 6-AAA semifinal loss at Bellefonte. He finished the season first on the team in tackles with 91, second in sacks with 6.5 and had one fumble recovery. That fumble recovery was returned for a touchdown; unfortunately a penalty flag wiped the points from the board. Corson was just one cog of an outstanding recruiting class for Wannstedt. One so good, it was rated #11 in the nation by Scout.com. Joining him at Pitt are WPIAL standouts Dorin Dickerson (West Allegheny, AAA state player-of-the-year), Aaron Smith (Gateway), Eiljah Fields (Duquesne, A state player-of-the-year). Outside of the WPIAL, Pitt will get one of the top tight ends on the recruiting trail in Nate Byham of Franklin as well as standout WR/DB Aaron Berry from Bishop McDevitt (District 3).